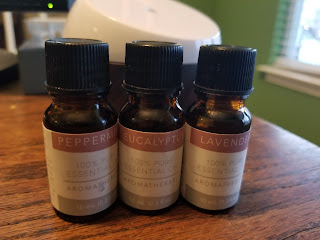 With my diffuser came eucalyptus, lavender and peppermint oils. Each smells terrific alone, and I have practiced with mixing several drops of each into the diffuser. I have used lavender in the evening as a tool to relax. I have used eucalyptus and peppermint together and individually for mental clarity during the workday. And, I have used each in my daily mindfulness practice. I can say that the eucalyptus oil really seems to help me slip into a great place when meditating. These essential oils, also by Sharper Image, pack a potent punch and only require a few drops to really provide a benefit. 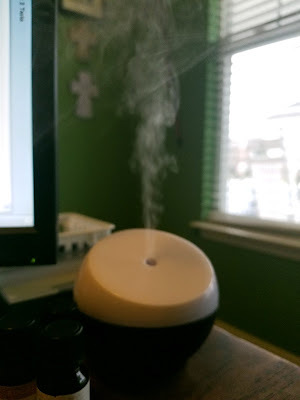 The diffuser very effectively disperses the oil while being nice and neat. It took me a few tries to get the hang of smoothly removing and replacing the lid after adding water or oil, but once I got the hang of the twist of the top it is a piece of cake. There are generally a few droplets on the desk after removing the top as a result of the condensation on the bottom of the lid, but it is a minor inconvenience when compared to the benefit provided by the diffuser. I was interested in finding articles about how essential oils can be used to relieve symptoms of Rheumatoid Arthritis. As a sufferer, I am always open to trying more forward-looking and less toxic ways to find relief. While I'm not yet sold on the diffuser as a source of RA relief, I am open to exploring it and will report back if I notice any benefits. As we close in (here on the East Coast of the U.S.) on the end of 2018 this evening, I wish you all a Happy and Healthy 2019. I thank you all for your encouragement and inspiration over the course of 2018 and I look forward to seeing where we go next year. Happy New Year friends.